Our unique and atmospheric location on the outskirts of the City of York makes the Yorkshire Air Museum a wonderful and imaginative venue for weddings and special occasions. The setting of the original World War Two base with lovingly restored wartime buildings will make your event unique. Your guests will leave with wonderful memories of a great event. Here are just a few comments from recent events…. “We got married at YAM during summer 2014 and it was a wonderful day. Sandrine, Grant & Jason were really helpful and made sure everything ran perfectly. We felt like our big day had some real character and our friends are still talking about what an awesome day it was 6 months later. We’re really glad to have chosen YAM and would recommend it to any couple who are hoping to have a well organised, unique, and joyful wedding day.” Richard & Faye. “We chose the Yorkshire Air Museum as our wedding venue as we wanted somewhere unique and capture great photographs and because we love planes! From the moment we called to enquire about having our big day there to after it, was such an enjoyable experience. We cannot thank Sandrine and Jason enough for all their hard work, help and ideas for making our dream wedding day perfect! It was more than we could ever dreamed of, we would also like to compliment the staff whose professionalism and friendliness will be long remembered. The food and drink Jason and his team provided were AMAZING! They catered brilliantly for the father of the bride who suffers with a severe nut allergy; no job is too big or troubling for them! All our friends and family have said it was one of the best weddings they have been to! They made our day so special and memorable!” Rob & Melissa. Events planning can be a stressful exercise. Whether you are planning your wedding reception, a special occasion to celebrate a family event or simply a special party for friends, our team will work with you from the beginning. We have years of experience to help you make your event exactly as you would wish it to be so do not hesitate to get in touch and start discussing your next event. For both receptions and parties the Elvington Room and the adjoining NAAFI Restaurant are allocated to your event to create a large and flexible space. They are located in the centre of the Museum alongside our original Control Tower and are permanently connected into a single complex. 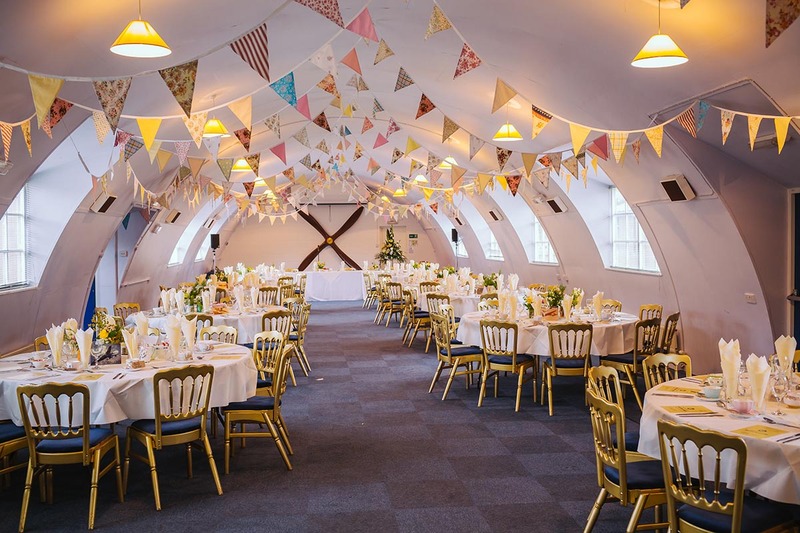 The Elvington Room is an authentic period building, with a domed roofline and provides a self contained facility with a main entrance, WC and central heating for your dinner or reception. For weddings we are happy for you to decide the way you want to transform the room with your own decoration and theme. The NAAFI Restaurant, heart of the Museum, is perfect for the evening with its own bar. While our dedicated caterers provide exceptional food and drink, with many options, the rest or the room can be transformed, offering an atmospheric wartime ambience with modern facilities and comfort. Many of our guests enjoy having the NAAFI Restaurant set up for your entertainment with dance floor, music and buffet if required, leaving the Elvington Room as an area to relax and enjoy conversation. Our on site NAAFI Restaurant with dedicated caterers provide exceptional food and drink, you will find menu options on the packages. It also uses fresh and locally sourced ingredients. Our catering team help our guests with everything from simple refreshments, through buffet lunches al the way to a full three course meal. The Museum has good contacts and relationships with local hotels and private bus companies. If you have a large number of guests staying in the City of York, we can help you arrange accommodation and transportation for everyone from York to the Museum and back if required. For Further information, to make a booking or to arrange a personal visit to discuss how we can tailor your event to your exact requirements, use our contact form here to send a message, email Sandrine Bauchet at museum@yorkshireairmuseum.org or call on 01904 608595 No request is too big or too small for our team!